My short comment, still leveling, lvl103, thundercrack is very good but vs bosses at least during leveling - hammer is yet not so effective, my stuff is ok, legion and kabraxis skin. I have not paid attention to fcr/ias or fhr yet. this comment is for others who are leveling. so I pushed to act 1 hell today. got all the mid tier, besides rings. just wondering where to farm the SUs? also my block chance is only 18%.. is that just due to my DeX or that I dont have the charms and SU shield? Really enjoying this build and your guide suggestions in Sigma so far and thanks for writing a clear TLDR type of guide. I always thought there was potential in the zerae hammer skill pre-sigma but couldn't get it right and didn't have chucknorris gear. 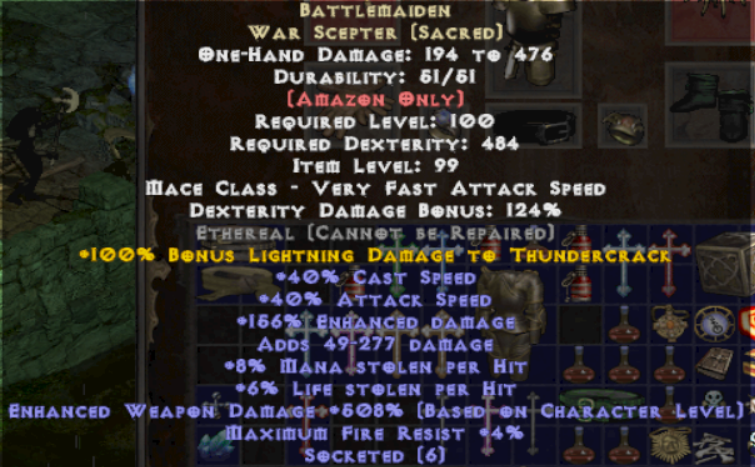 I do loving crafting though, curious on your thoughts for this roll. 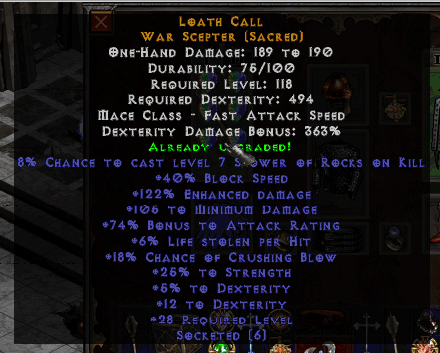 Understood getting a good set of rolls on war scepter is highly unlikely given combined stat pool. The SOR proc just seems to fit this play style really nicely. in addition to + skill this-not-so common fcr( for non pure caster items). I immediately felt the diference with the hammer when my fcr went from 20 to 40. Xtraordinary_U wrote: so I pushed to act 1 hell today. got all the mid tier, besides rings. just wondering where to farm the SUs? SUs only start dropping in hell, so you likely won't find many yet. The TUs can carry y ou well into charms, probably complete a little over half the charms. Your dex will begin to pick up faster with more charms and the 400 stat points you get from signets of learning. certainly a pretty good roll considering the affix pool. 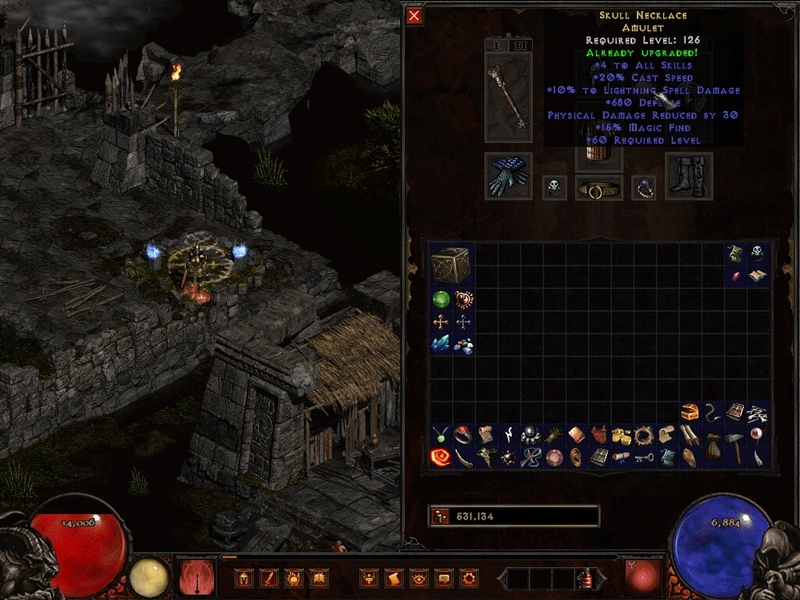 Shame it rolled minimum damage and somewhat low ED, but overall its orbed pretty well and looks decent. You'll want more cast rate on it though. Controller found an eth a week or two ago and him and I have both had issues hitting the damage cap with hammers. Nice find. Should massively incresae your damage. Not worth it. 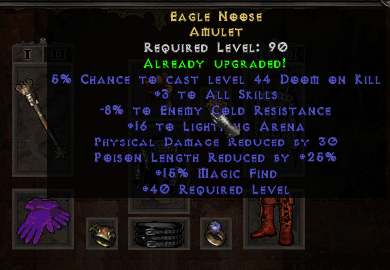 You can roll fcr on a rare amulet. if you want a decent unique amulet, black dwarf heavily outclasses this one. the one I'm using isn't even that good, but it does what I need it to. So many people go on and on about what's best in slot versus just getting what your character actually needs. Question.. If Hammer of Zaraoe via COTW were to be found, could I play as a Lioness spearzon and still use it? Is it a "melee" skill?